John Toulze is a native of Northern California from a third generation French family. Cooking was, and continues to be, a strong passion in his family life. John started his career in hospitality at Viansa Winery in Sonoma in 1994. 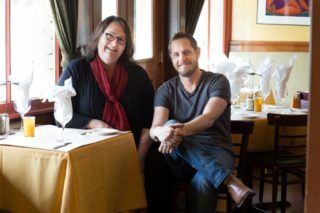 After several years of cooking and wine sales, John left Viansa winery to help Sondra Bernstein open the girl & the fig restaurant in Glen Ellen. Twenty years later, John is not only the Executive Chef but also the Managing Partner. The restaurants’ farm to table experience then grew from the herb gardens at the restaurant to working an organically farmed culinary garden also under John’s care. John believes his immersion in “the farm project,” as they call it, has taught him to be a better chef, giving him an intimate understanding of what seasonality really means. John discovered a passion for creating salumi. He mastered the artisanal art of curing meats and continues to teach our other chefs so they can keep up with the production. Under the brand MANO FORMATE, bacon, pancetta, prosciutto, guanciale, lonzo and salami are just a few products that we produce in-house. John received a Rising Star Chef award in June 2009.